We are celebrating people with great ideas and innovations. We have created these awards to recognize and celebrate the smart and innovative Pakistani faculty, students and startup companies. 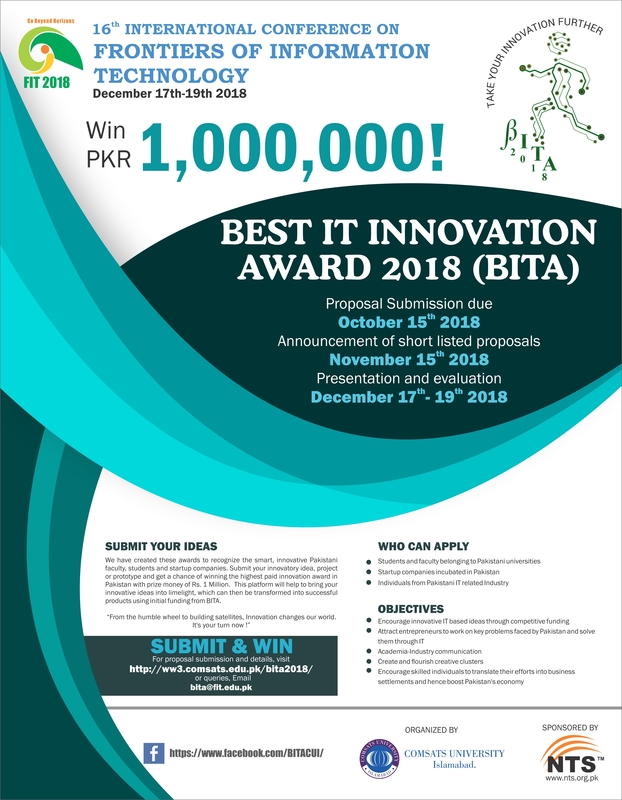 Submit your innovatory idea, project or prototype and get a chance of winning the highest paid innovation award in Pakistan with prize money of Rs. 1 Million. This platform will help to bring your innovative ideas into limelight, which can then be transformed into successful products using initial funding from BITA. From modest wheel to building satellites, innovation changes our world. It's your turn now! Best IT Innovation Awards (BITA) recognizes and encourages creativity in the field of Information Technology. It is the highest paid IT award in Pakistan with prize money of Rs. 1 Million. The main aim of BITA is to facilitate students, academicians and industry professionals in transforming their ideas into prototype with an initial funding. COMSATS Institute of Information Technology, Islamabad, Pakistan. © 2018 Best IT Innovation Award (BITA).